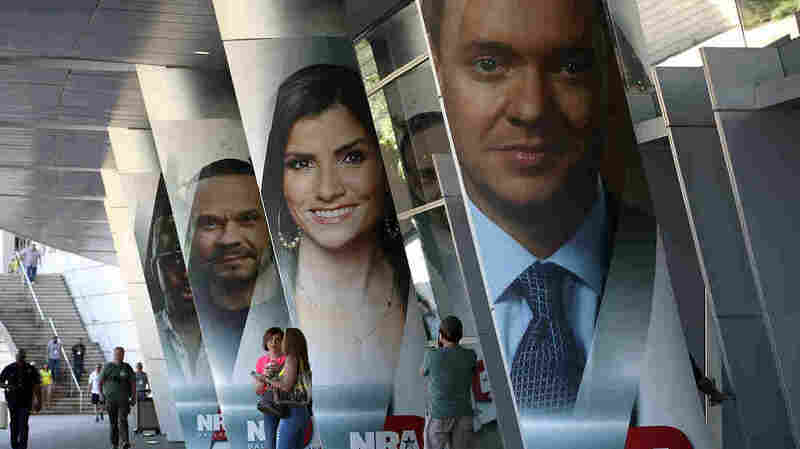 NRA Says It Faces A Financial Crisis In Lawsuit Against New York State Officials The National Rifle Association says insurance companies are backing away from the organization, threatening its ability to operate. The National Rifle Association, which held its annual meeting in Dallas in May, has filed a lawsuit against New York state officials claiming they are pressuring financial institutions to stop doing business with the organization. The National Rifle Association says it could soon face a financial crisis that will force it to shut down some of its operations, including broadcasts by its NRA TV division. The gun rights group blames a campaign by Democratic New York Gov. Andrew Cuomo aimed at discouraging insurance companies and other financial institutions from doing business with the NRA. The organization has filed a lawsuit against Cuomo and the New York State Department of Financial Services in federal court, alleging that Cuomo and state regulators seek to "deprive the NRA and its constituents of their First Amendment rights to speak freely about gun-related issues and defend the Second Amendment." Brian Mann, who reports for NPR and North Country Public Radio, says the suit claims Cuomo's actions could "deprive the NRA" of banking, insurance and other financial services that are "essential to the NRA's corporate existence." The NRA is asking for an immediate injunction to prevent state officials from "interfering with, terminating, or diminishing any of the NRA's contracts and/or business relationships with any organizations." "If the NRA is unable to collect donations from its members, safeguard the assets endowed to it, apply its funds to cover media buys and other expenses integral to its political speech, and obtain basic corporate insurance coverage, it will be unable to exist as a not-for-profit or pursue its advocacy mission," the lawsuit states. "Defendants seek to silence one of America's oldest constitutional rights advocates. If their abuses are not enjoined, they will soon, substantially, succeed." The news that the NRA may be in financial woes is being cheered by student activists and survivors of recent mass shootings, like Emma Gonzalez and David Hogg. The advocates from Parkland, Fla., say the news is evidence "the young people are winning." New York's governor doesn't appear to be backing down. In a statement, Cuomo has described the NRA's lawsuit as "a futile and desperate attempt to advance its dangerous agenda to sell more guns." "In New York, we won't be intimidated by frivolous court actions from a group of lobbyists bent on chipping away at common sense gun safety laws that many responsible gun owners actually support," the governor's office said. "I am proud of my 'F' rating from the NRA, and I will continue to do everything I can to keep New Yorkers safe." But Cuomo also acknowledged that in April, he directed state regulators to "urge insurance companies, New York State-chartered banks, and other financial services companies licensed in New York to review any relationships they may have with the National Rifle Association." Cuomo argued that such ties could "harm their corporate reputations and jeopardize public safety." In an email to NPR, the NRA said pressure from regulators amounts to a blacklisting effort. "The NRA has encountered serious difficulties obtaining corporate insurance coverage," the email said. "If insurers remain afraid to transact with the NRA, there is a substantial risk that NRA TV will be forced to cease operating." The NRA says it has 5 million members, and USA Today reports the organization takes in an annual average of $128 million in donations. In 2018, the group set fundraising records, and the NRA Political Victory fund took in $2.4 million in donations during the month of March alone, according to The Washington Post. HuffPost reports the NRA typically receives spikes in donations in the wake of mass shootings. After the Parkland school shooting earlier this year, Salon reports donations to the organization increased by nearly 500 percent, compared with the week prior to the tragedy. A lot of that money goes toward backing politicians that support the gun lobby. In 2016, the NRA spent $61 million backing current members of Congress, and President Trump received $31 million in advertising from the NRA during his campaign, according to USA Today. In recent years, the NRA has expanded its media outreach, distributing highly-produced videos promoting gun ownership over the Internet and cable. Many of the videos on the NRA TV service are also critical of the national news media. Over the past week, protesters have gathered to march against gun violence. On Thursday in Chicago, activists demonstrated over a recent spike in homicides, according to The Independent. USA Today reports that on Friday, during a visit to western Kentucky, Oliver North, the incoming president of the NRA, was met by both "an enthusiastic welcome" and protesters who shouted, "Shame!" Survivors of the Marjory Stoneman Douglas High School shooting in Parkland, Fla., organized a demonstration for Saturday outside the headquarters of the NRA in Virginia. The Washington Post reports that the "teens will be joined by activists, protesters and survivors of gun violence to protest the NRA's role in blocking gun-control legislation and defending sales of guns such as the AR-15, the semiautomatic rifle used in the Parkland, Fla., massacre." Lawrence Nathaniel, 25, executive director of the National Organization for Change, told The Washington Post, "The NRA has the ability to be the organization that fights for Second Amendment rights while also fighting to protect each and every American citizen, but they choose not to. They would rather threaten and antagonize us than sit down and talk about how we can work together to make sure every American has a quality and safe life."